It has been a damp week. It did not affect river flow until last night. River level is normally 22-23 cubic meters per second (cumecs) measured at the flying fox in Turangi. Last nights rain increased the flow to 37.2 and is now receding and at 11.00am today is at 36.7 cumecs. It is a very minor flood, not the flood that I have been wanting to smash all the branches and twigs buried in the river bed of the lower river. It has been a costly area to fish this year. I have lost more flies in a week of fishing downstream than I would lose in a season in previous years. I have received heavy rain warnings from Civil Defence as well as hearing of strong winds ion the Desert Road. At this time it is overcast, damp and relatively calm. I need to say that the Desert Road is a significantly different environment to that of Turangi. Tonight it is raining heavily but the forecast for the weekend looks good. I talked with him at the end of the hour when he had fished through the pool moving downstream. He was happy to show me his gear. Three weighted nymphs (a bead head and black body) the nymphs being 1 meter apart. The hooks were barbless, he netted the fish in mid stream and released his fish very quickly. The line cast was 8lb Nylon with only the weight of the nymphs to assist his casting. The long length of nylon was attached to a fly line but he did not need to use the fly line in playing any of the fish. Nymph anglers concentrate on watching their indicator for evidence of a strike. He had no indicator and simply watched the last bit of nylon before it went under. His 15 years fishing experience had taught him to recognise the slightest presence of fish at his nymphs and generally he hooked and netted a fish in less than 5 casts. I was impressed with his ability but I wondered about the technique. In my 40 years of fishing this river I watched the introduction of weighted nymphs as a technique when the recommendation was made at a meeting of the Central North Island Wildlife Conservancy council chaired by Budge Hintz. The council recommended to then manager Pat Burstall of Internal Affairs that a weighted nymph be allowed. 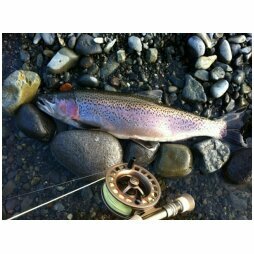 What a change that created with fights between nymph anglers and wet fly anglers. The anger was because the established fishing etiquette was being ignored. On the Lake further development has allowed jigging which wanted three flies. Downriggers were also permitted. So in 40 years angling techniqu has evolved. I recall asking John Gibbs at a Taupo Fishing Advisory Committee meeting approximately 5 years ago what constituted fly fishing. The response was that it involved the use of a fly rod, a fly reel a fly line and legal flies be they lures or nymphs. My discussion with the young Czeck was whether the technique he was using was truly fly fishing. He met the requirements of rod and reel and flies. The only questionable matter was that while he had a fly line on his reel he did not use it. I was left amazed at what I had seen I have seen anglers have great success with wet lines and with nymph when the fish are running. He was catching fish when the few anglers around over past weeks were stating that the fishing was hard. I received this email from Waikato Regional Council re work on the river. Just a heads up to let you know as part of our Annual Works Programme on the Turangi Flood Scheme we intend on undertaking mechanical vegetation clearance in the coming weeks. This will involve mulching down some of the juvenile willow we had sprayed earlier in the year. These willows have now all died off and we will be mulching them down to ground level to keep the flood way open through the Turangi flood scheme. The work will be undertaken with a hydraulic excavator with mulching head attached. All work will be undertaken in the dry and no wet channel river work is being undertaken. See below for the areas concerned. If you have any questions or concerns please give me a call. New Fishing season begins Tuesday 1st July.